Tap your enemies to death in Namco Bandai's shallow and annoying iPhone shooter. Time Crisis Strike is Namco Bandai's attempt to recreate the series' arcade magic on the iPhone. Although the game sports decent looking graphics, some tense moments and classic Time Crisis sound effects and music, its annoying controls and lack of content make it an overpriced ($5.99) and frustrating app you should avoid. Similar to the classic arcade games, Time Crisis Strike pits you against a small army of terrorists, except instead of killing them with a plastic gun, you tap these evildoers with your finger; not nearly as enjoyable as in the arcade and on PlayStation 2/PlayStation 3, but it works. You'll slaughter metal clawed ninjas, rocket firing madmen and even battle a tank, all while trying to beat the clock. To say that the game's intense would be an understatement. In trademark Time Crisis fashion, you reload by ducking behind objects like jeeps, boxes and pillars. Doing this not only replenishes your clip, but also avoids critical strikes that deplete your health. In the arcade and on consoles, you press a foot pedal or a button on a controller, respectively. On the iPhone, Namco Bandai forces you to tilt the device away from or towards you, depending on which option you choose. Doing this, unfortunately, darkens the screen and obscures enemies. It simply doesn't work and basically ruins the game. Why the company failed to include the option to hit a button to perform this action is anyone's guess. Enemies also have a nasty habit of unleashing critical strikes at the most inopportune times. It gets to the point where you'll pop out from behind a corner and get hit without warning. As a result, you need to play conservatively throughout the entire game or you'll take rockets to the face. We're also upset with the game's length. 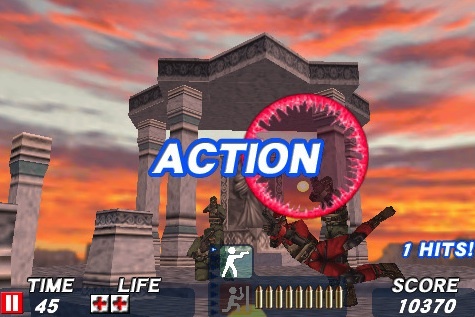 Time Crisis' Arcade mode has only three short levels. Namco Bandai attempted to add value with Crisis Missions, mini-games that challenge you to complete various objectives before time expires, but they only serve to anger us because of the ridiculous tilt controls. You can't expect us to kill nine enemies in 15 seconds when we can barely see them. On top of that, the game lacks an online leaderboard. At the very least, we should be able to post our best times for others to see. All of this adds up to a missed opportunity. Namco Bandai was on the right track with touch shooting, simplistic but effective 3-D graphics and catchy Time Crisis music, but the average controls, coupled with only three stages makes Strike one of the iPhone's most disappointing apps. What's Hot: Familiar Time Crisis music and effects, frantic arcade style gunplay, three difficulty levels. What's Not: Awkward tilt controls, only three stages, cheap enemies, no online leaderboard.